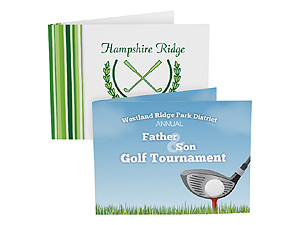 These custom cardstock golf theme folders allow you to imprint your own full-color artwork on window border, front and back covers! Availability: Requires 10-14 business day lead time before shipping. 150 piece minimum. No returns or exchanges. Add To Cart to view ship rates and delivery dates. Personalized customized printed full color golf photo folders.are great promotional advertising and marketing giveaways for your next golf tournament, charity golf outing or golf event. Whether your message is large or small, you'll make a big impression at your next event with a full-color custom printed photo frame. Thank your sponsor, convey your mission statement and build recognition for your company name and web address. 4" x 6" size picture opening measures 5-5/8" x 3-5/8"
Please Note: This item is made to order and is therefore non-returnable.